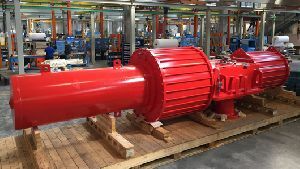 Rotork has received an order for 220 pneumatic actuators for the NASR Phase II Full Field Development Project in the UAE. The aim of the project is to increase the field's oil production capacity to 65,000 barrels per day (BPD) from the existing capacity of 22,000 BPD. Due to the huge force required to compress the spring, this requirement is beyond the performance limits of the standard range of Rotork GP pneumatic actuators. However, faced with this challenge, the Rotork Research & Development department successfully created an innovative and simple solution. The resulting actuator is the largest GP350 actuator built to-date, with a total length of 8.5 metres and weighing 19 tonnes.